As is consistent with my Food Preparation Series and Creative Food Series, I will have some quotes from “Wikipedia” with regards to the food items that I am going to post. I believed that readers should have a better knowledge on the topics instead of just “whole heartedly” follow what I mentioned in the post. 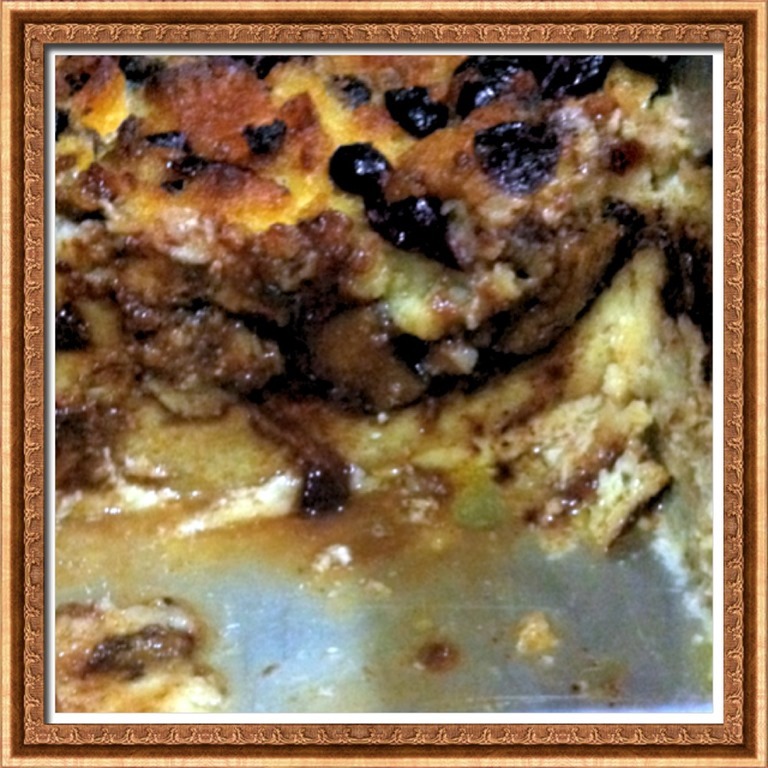 “Bread pudding is a bread-based dessert popular in many countries’ cuisine, including that of Cuba, Ireland, Great Britain, France, Belgium,Puerto Rico, Mexico, Malta, Argentina, Louisiana Creole, Germany, and the southern United States. In other languages, its name is a translation of “bread pudding” or even just “pudding”, for example “pudín” or “budín” in Spanish; also in Spanish another name is “migas” (crumbs). In Mexico, there is a similar dish, capirotada. It may be served with a sweet sauce of some sort, such as whiskey sauce, rum sauce, or caramel sauce, but is typically sprinkled with sugar and eaten warm in squares or slices. In Canada it is often made with maple syrup. 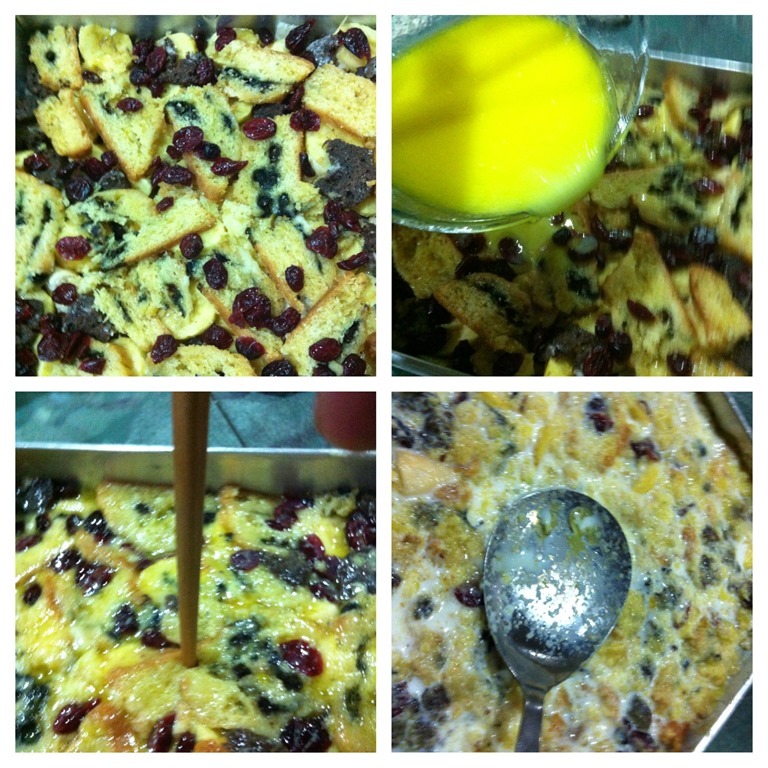 In Malaysia, bread pudding is eaten with custard sauce. In Hong Kong, bread pudding is usually served with vanilla cream dressing. In Mecklenburg-Vorpommern, Germany, black bread is used to make “black bread pudding” (Schwarzbrot pudding). In Hungary it is called ‘Máglyarakás’ which is baked with whipped egg whites on top of it. In the above quote, it is stated clearly that “THERE IS NO FIXED RECIPE” and usually made from… The important word is no fixed recipe. You can easily made substitutions to almost everything but the bread and eggs. Even then I have substitute the bread with some Chinese New Year Cookies and you can read it here. The theory behind the proposed usage of bread and eggs are the need to have some glutens and liquids to hold the “mixture” in shape.. Any things that contain gluten are possibilities to explore. Gluten is a protein in the flour that when combines with water will produce an elastic and web like structure and if it is too technical, just think of it as wheat flour. For example, bread, scones, muffins, biscuits, breakfast cereals, donuts…..These are called “strengtheners”….. However, baking flour alone will yield you nothing, you need liquids… Eggs are used because it is a perfect binding agent (meaning hold the flour together) and give you a nice aroma. Eggs here serves both as a role of “strengtheners and tenderizers”. Other liquids can be explore such as milk, melted fats (butters), waters.. Use your sense to mix and match and you will soon find an optimum combination that you and your family like. 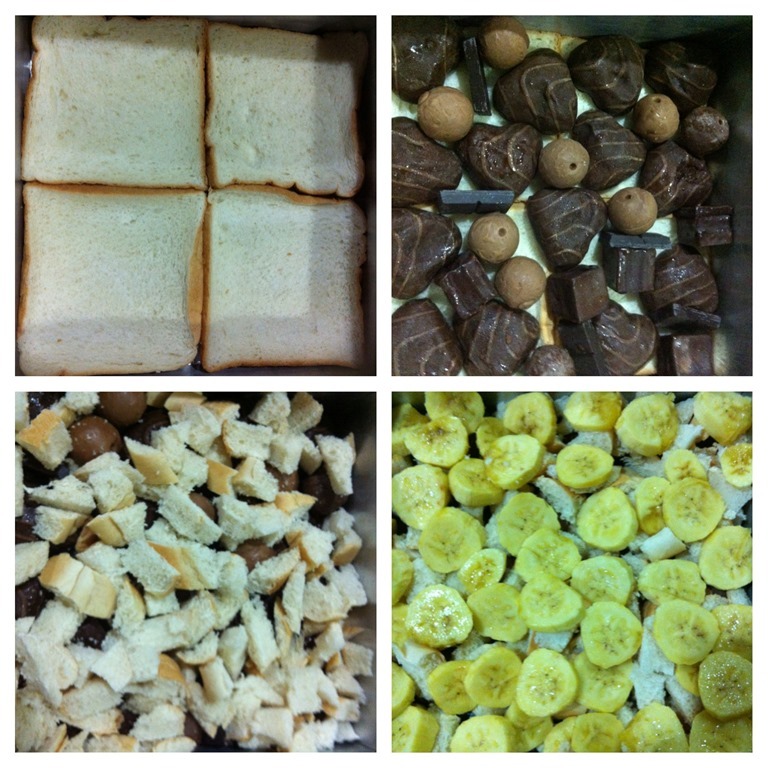 But remember “Garbage in garbage out”, if you want a simple taste, white breads will do. If you want other flavors, you can have cinnamon rolls, chocolate donuts etc. and it would not do you any harm as long as the ingredients are still edible and you like the tastes. Looking at the Wikipedia quote again. “……..and usually made from stale bread……” Stale breads are breads just a fraction of time away before fungi and mold finds its new home, meaning breads that are not that fresh, textures have slightly change, in your house already a few days but before it turns moldy…The “inventors” of bread puddings have found this wonderful combinations to hide away all the negative perceptions of these stale breads. They used eggs and milk and butters to enhance to taste and texture and making foodie would not able to resist a bite without knowing how it is prepared. Some stale breakfast loaf as a “foundation” for my puddings. The sides have started to “shrink” meaning a lack of moisture and should be consumed as soon as possible. Some bananas. Why bananas? I bought a bunch of banana and after a few days of eating, I still left with 4 pieces and fruit flies kept visiting them, I thought I might as well threw it in. Some sugar – depending on the “type” of “sweet tooth” you have, some sugars to sweeten it. Yes, I forgot to say, condensed milk or creamer is a perfect substitute. 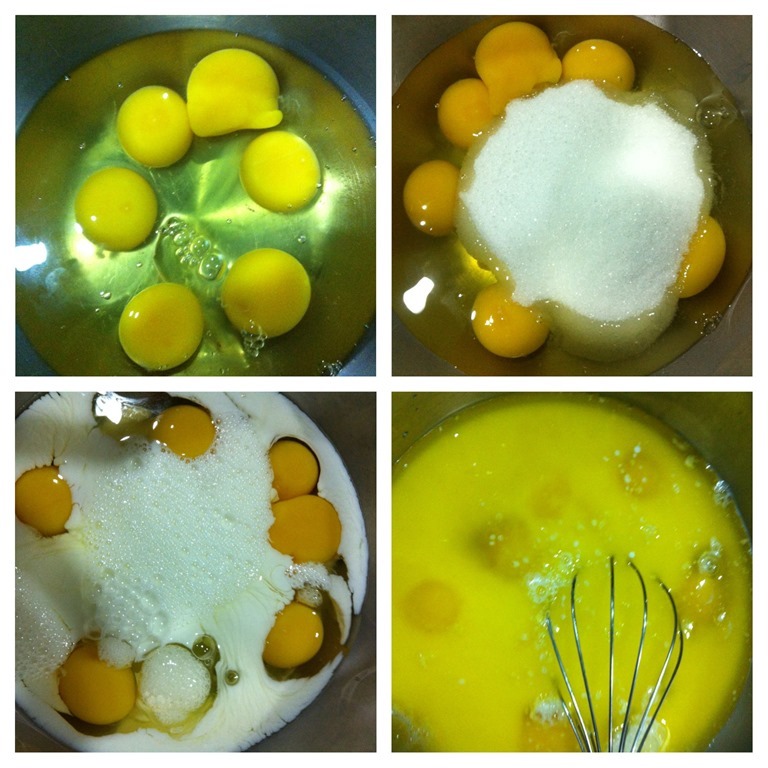 In a mixing bowl, break your eggs, add sugars, milk, melted fats and used an egg beater to whisk the mixture until well mixed and if possible, all the sugars dissolved. Of course, you can use an electric mixer to do the job. Set aside for later use. Here come the process that I like most and it all depends on your own creativities. 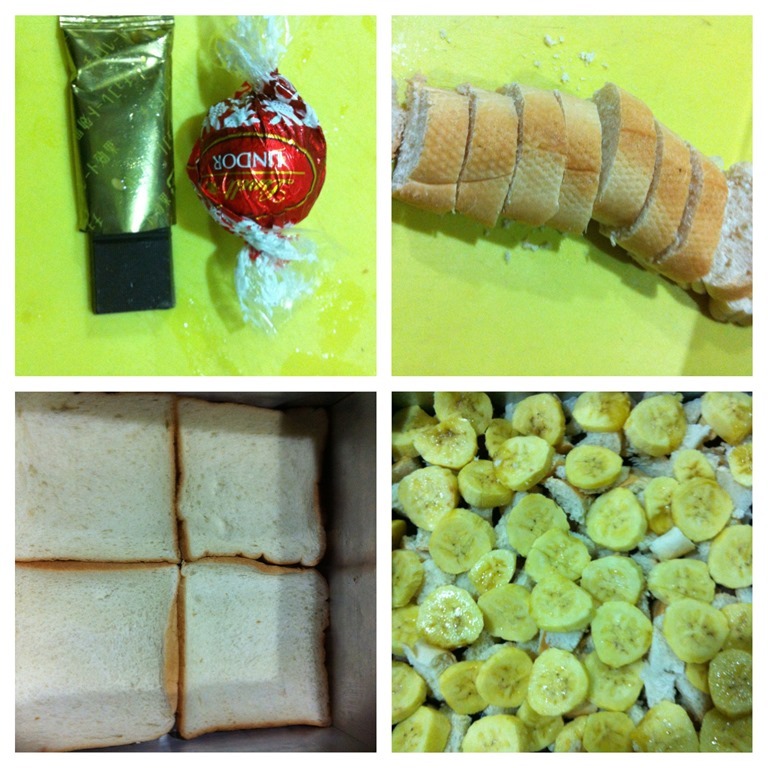 Fourth Layer – Banana slices. Is it not beautiful? Fifth Layer – slices of lemon icing scone and chocolate donuts bought from Starbucks three days ago. I sprinkled some dried cranberries (it possible, soaked in hot water or rum) on top to make it look more appetizing. Pour your liquid mixtures into the layers of dry ingredients. Don’t rush, let it go and fill all the holes that they can find. Alternatively, you can soaked all the dry ingredients first and dump everything in the baking tin…Then, you would not have a nice layer in your final puddings. I like to “poke” the dry ingredients. Once you poked, suddenly, all the liquids will disappear (try to think of a sponge). You will be surprise to see how much liquids these breads can absorb. Poke and pour and poke and pour and poke and pour until you are satisfied that all the breads are full and cannot take in any more “drinks”. Heat your oven’s to about 180 degree Celsius and bake for about 30 to 45 minutes or until set. Until set means when you push your baking tin, you are pushing a tin full of solid or semi solid instead of a tin of water. Imagine you are eating an egg tart or bean curd jelly “tau hua”. Temperature of the oven can also be adjusted. Only you know your oven well, if you find that your pudding is slightly burnt and yet to get set, lower the temperature. In this “experiment”, after 30 minutes, I have lowered my oven temperature to 150 degrees because the center of pudding is still not that firm and the top layer appeared to get burnt. If you looked carefully, you will see that I am using “steam bake” method for the baking of the pudding. Steam bake means you put some water in the oven and let the water vapors generated to moisten your puddings. However, this is not absolutely a must if your liquids are enough. After 40 minutes, my pudding is ready. Overall, it took about one and a half hour from preparing the ingredients until “full completion”. Can you see the crispy top layer. In the unlikely event that you don’t have any oven, don’t worry, just steam it. It will turn out as delicious except that you do not have the golden brown top layer. I only “cut” plus “scope” the puddings this morning. If you look carefully and go back to the layers that I have mentioned above, you will be able to identify the various in this “ugly” puddings. Remember the second layer of chocolates? It was replaced by a light yellowish layer of egg puddings. When you bake, the chocolates will melt; if it is too hot, all the fats will be excreted leaving a layer of cocoa powder. When they are empty spaces, the eggs and milks will drip down to fill the cavities and become egg puddings. Actually, this is the layers that I like most. Soft and tasty and complement the hardier texture of all the other ingredients. Yes, serve with some cold chocolate fresh milk. If you serve this as a dessert, you can serve with maple syrups, ICE CREAMS…..
Lastly, my wife complained that the shape looks terrible when I put one scope into the bowl. 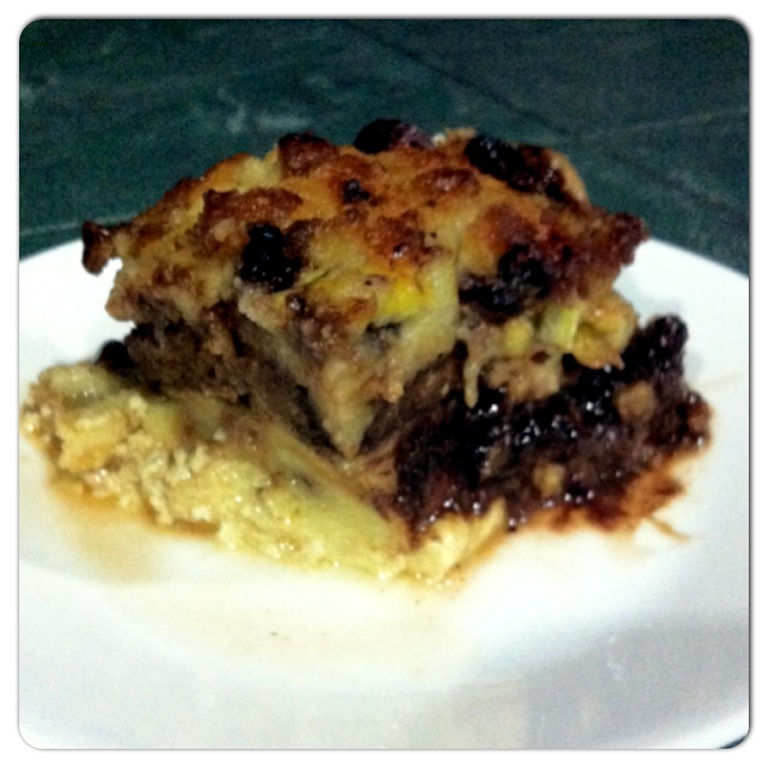 I protested that bread puddings should look something like what I baked. Shapeless means it is soft and moist.. To defend my ground, let’s look at some of the pictures in the internet. This capirotada, or Mexican bread pudding, features layers of nuts, cheese, dried fruit, and bread drizzled with cinnamon-infused sugar syrup. This is a rather long post and I hope you like the post. Feel free to try your own versions and share with me about your own adventures. This entry was posted in Cakes and cookies, Creative Food Series and tagged 10, 8, bread puddings, breakfast, chocolates, Creative Food Series, desserts, Food Preparation Series, milk, postaday, puddings. Bookmark the permalink. ← Is This Living or Non-Living Things? This looks super yummy, I have bookmarked it. Thanks for stopping by my blog and liking my soups. Have a pleasant day!!! Liz, I think our style of sharing the recipe is very much similar. That is why I like the way you present it. You are a master in this field, I am sure you can share with readers some unusual puddings recipes that you have baked and I am sure readers will be pleased to use this as another reference. Thanks for reading. Thanks for the compliments . I haven’t posted much on desserts but I started this week. I love your style of presenting too, makes it much easier to follow the recipe. I can never bake from a book without photos, because I always need to see what I am about to make. Have a great weekend. I like bread pudding a lot. Adding chocolates to it is a twist I never thought about, nor donuts, or eating it with chocolate milk poured over it. 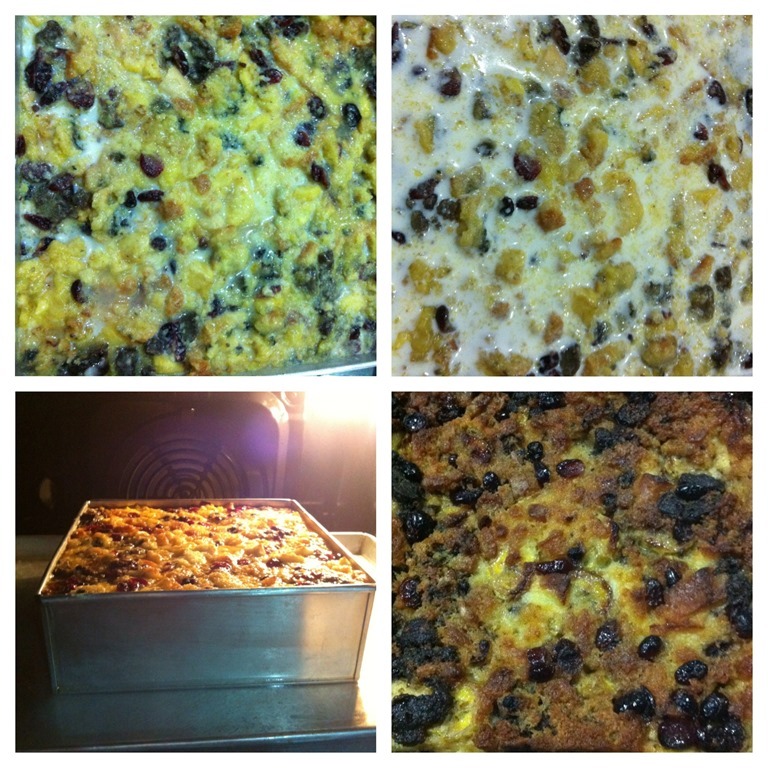 I don’t think your picture of bread pudding is ugly either. 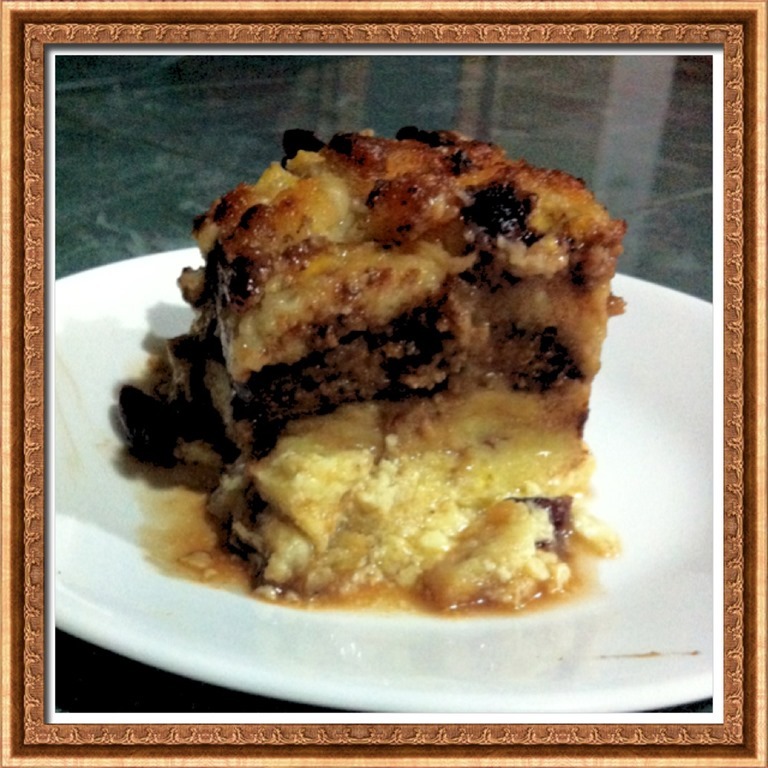 It looks like bread pudding is supposed to look like – yummy! 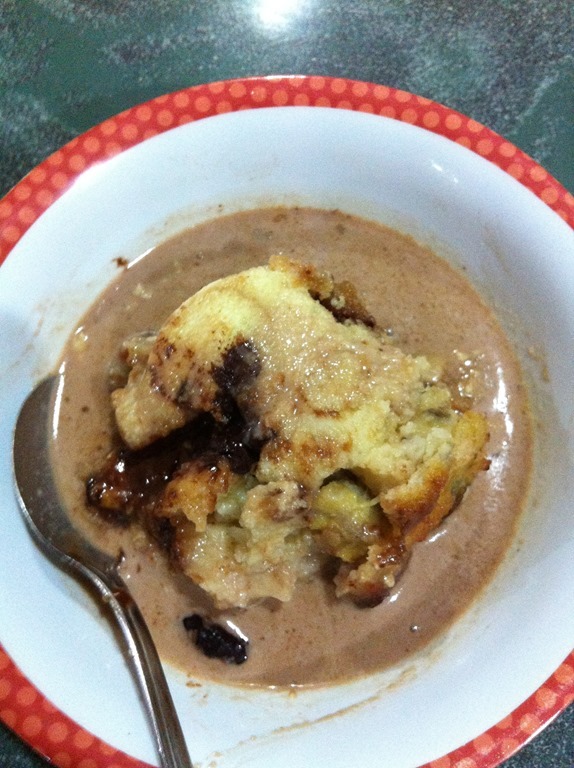 Very very frankly, before I baked the puddings, I do not know how it is going to turn out….I seldom repeat my recipe and I believe you will agree, you don’t always have extra chocolates for bread puddings. 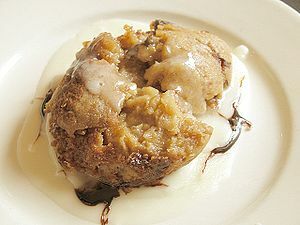 As far as home baking is concerned, bread puddings are supposed to be a “junk” recipe to get rid of all your stale but edible foods. But if I want to treat this pudding as a posh restaurant dessert, I will definitely consider putting chocolates as the taste was just very different. 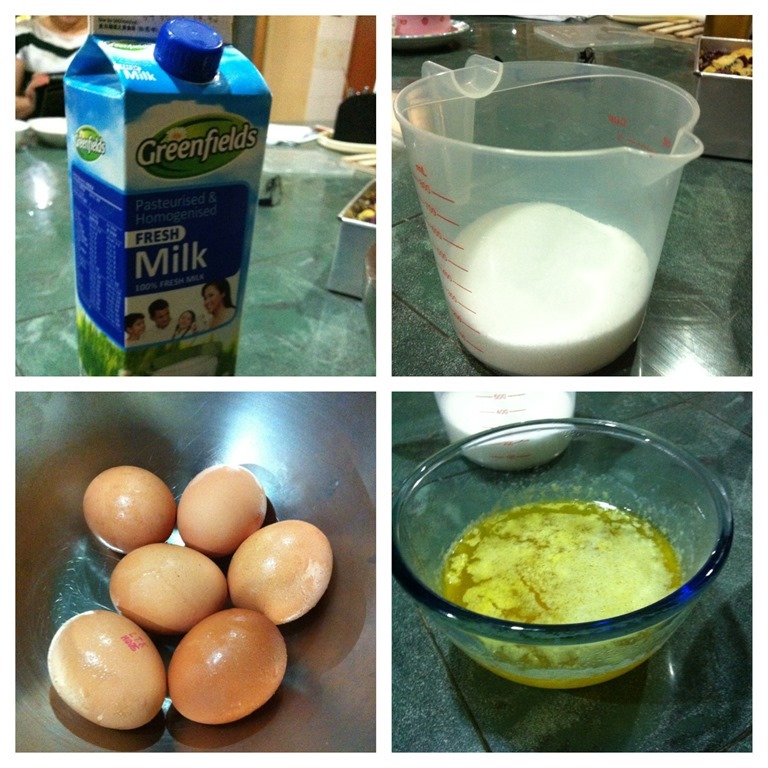 Adding milk is my kids request and it is really very yummy….. Thanks for reading. I knew it was for stale bread, but I can see your meaning of using it kind of as a catch all for leftover sweets and things. I definitely will try the chocolates and chocolate milk. It looked really good to me! I like to eat bread pudding. this is my first try using ur simple recipe. Hope it works!